In a word: Get out there and eat one! Brandy, Ethan, JM, Mark, and Nichole ate the #7 and a half-and-half #1 & #8 and rosemary bread (comped) with a juice box, a Coke, and three beers. The bill was $58, or $11/person, plus tip. Brandy, Ethan, Mark and Nichole gave Salvatore's Tomato Pies an A; JM gave Salvatore's Tomato Pies an A- (see our grading rubric). We've mentioned Main Street Sun Prairie's wealth of Italian-American food before, after we were lucky enough to go to Anna's Pizzeria and Deli Roma. 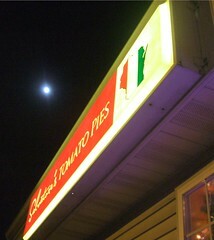 Salvatore's Tomato Pies is a third transcendent spot on the drag. It's a family operation that won over a following almost instantly. It would be easy for them to say "yes" to the demand for more hours, more space, more menu, but so far they've kept it simple. And they have a nice kids' play area, a ThinkGeek math clock hanging on the kitchen wall over the shoulder of a dough-tossing expert, and one partner might spell her name with an "h". What's not to love? We ordered some Cokes, juice boxen, beers, and rosemary bread (which was provided free of charge for a "long" wait which really wasn't that long) and two pizzas. 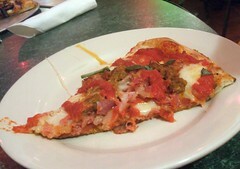 One pizza was a half-and-half original tomato pie: cheese and sauce all over, and sausage and ham added to one side. The crust was thick and chewy, but flavorful and never boring. 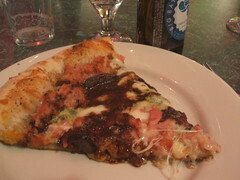 The sauce was slightly sweet and the cheese was rich whole-milk mozzarella. The sausage was moist and floral with fennel and fresh basil. 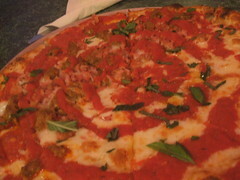 The other pizza was a new-ish special, the #8. If Nichole had to pick her ultimate (as in last) meal, this would be it - it was the ultimate (as in peak) of culinary harmony. If we had to dissect it, we'd have to talk about how the balsamic vinegar reduction was both stinging and sweet. How fig seeds popping between molars evoked Newtons and lunchroom swaps and extra time at recess. How musky gorgonzola and smoky bacon were reminders of Midnight Mass or any number of funerals. But we don't want to take it apart, because it would destroy the Mystery. Every bite was like the Circle of Life in your mouth. Since we've been they've morphed it into a dessert pie by adding dark chocolate to the mix. May we say, "Yum?" We don't know from pizza dogma, but this stuff is delicious and made with care. Memento mori, and buon apetito. 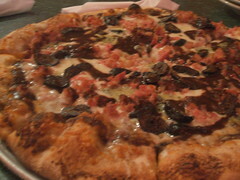 Figs, Gorgonzola and bacon? Sounds absolutely divine! I'll have to keep that combination in mind! What? Tomato pies in Wisconsin? I have to get out there immediately. 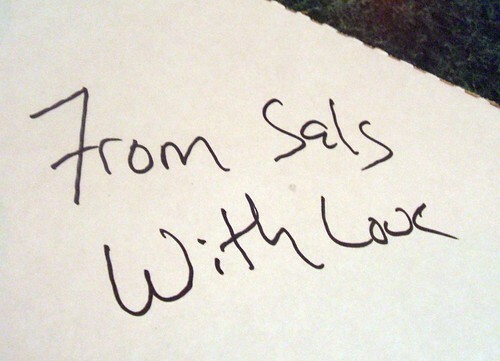 We're grateful to Isthmus for putting gems like Sal's on their Eats list. That fig and bacon pie is the stuff of dreams. So. Freakin'. Good. I don't live in Sun Prairie but that thing could make me a regular.